Installing in minutes and is designed to fit all types of seats, from lightweight manual race seats to the most complex electric seats from Porsche, Rennline's two-piece design allows you to remove all visible components in seconds to revert to a factory look. While other rail mount systems are fixed and limit your seat travel, our EZ-Adjust Slider allows you to make a wide range of seat adjustments on the fly. 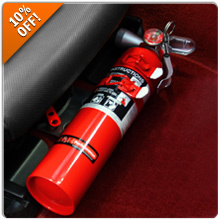 Now you can take 10% Off when you Use Promo Code FIRE10 at Checkout!